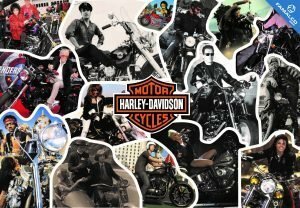 Now nearing its 115th Anniversary, the legendary Harley-Davidson brand is known world-wide as a flagship brand of American motorcycle culture expressing freedom and passion for all its riders. Harley-Davidson can trace its foundation back to 1903, where William S. Harley and Arthur Davidson began the first production of Harley-Davidson motorcycle in a small shed in Milwaukee. The all-American brand quickly rose to prominence shortly after the First World War where in 1920 Harley-Davidson became the largest motorcycle manufacturer in the world, having 2,000 different dealers in 67 countries worldwide. Through their worldwide popularity, it was only a matter of time till the iconic motorcycle brand found its way on film sets in Hollywood. The first-ever appearance of a Harley-Davidson motorcycle occurred in none other than a 19 minute silent film by the great Buster Keaton in 1920. The slapstick comedy film, titled ‘The Scarecrow’ finishes with Keaton getting married on a Harley-Davidson Model J whilst riding away. While Harley-Davidson continued to appear in several movies, it was only until the 1950s that the brand’s rebel biker culture was recognised in films. Movies like the 1953 drama outlaw-biker film ‘The Wild One’ starring Marlon Brando and more importantly, his Harley-Davidson riding nemesis Lee Marvin, whose portrayal as a leather-wearing gang leader riding for freedom set the stage for all Harley-Davidson enthusiasts. The rebellious image of a Harley-Davidson rider was popularised during this period, by films such as Jack Nicholson’s 1967 drama ‘Hells Angels on Wheels’ and 1969 biker cult classic ‘Easy Rider’ starring Peter Fonda. In more recent times Harley-Davidson motorcycles began featuring heavily in a number of action scenes, quickly becoming the ideal ride for protagonists due to their recognisable brand image and global popularity. Harley-Davidson motorcycles proudly took centre stage in multi-million dollar productions such as Sylvester Stallone’s 1982 ‘Rocky III’ and 2010 ‘The Expendables’, Arnold Schwarzenegger’s 1991 ‘Terminator 2: Judgement Day’, Quentin Tarantino’s award-winning 1994 classic drama ‘Pulp Fiction’ and Steven Spielberg’s 2008 fantasy film ‘Indiana Jones and the Kingdom of the Crystal Skull, starring Harrison Ford and Shia La Beouf. Harley-Davidson’s legendary motorcycles also found their way into the hands of incredible superhero’s within the Marvel Universe. Noteworthy cameos include those in the X-men, Captain America and Avengers franchise, where protagonists often find themselves revving their Harleys in and out of danger. Thanks to the continuous presence of Harley-Davidson in cinema, the American brand become incredibly recognisable and present in all forms of media. Harley-Davidson bikes can be found almost everywhere, headlining in animations, TV series, video games and as well as in various music videos. For more information about Harley-Davidson contact us on (+356) 2339 2328/9 or on info@FapiMotors.com. Harley-Davidson motorcycles, parts and merchandise are available from Fapi Motors Ltd, which embraces the same core values of hard work and innovation as its parent company, Famalco Group. Fapi Motors is a Mobility Business Unit within Famalco | Building Businesses.